When selecting a camera, it's important to consider the dynamic range of your sensor. 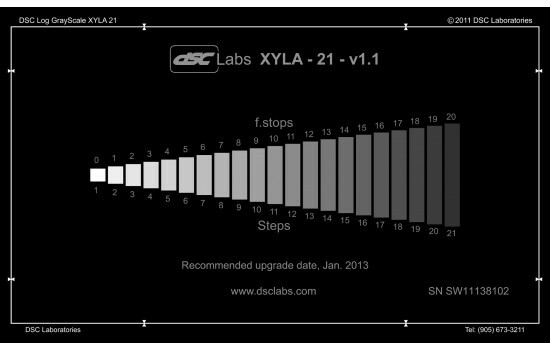 Ensure an accurately measured dyanmic range using the latest high dynamic range test system from DSC Labs - the Xyla. With its built-in light source, the Xyla has an opaque surround to reduce camera flare and discrete, numbered, spectrophotometrically neutral steps which can be viewed individually or in groups. 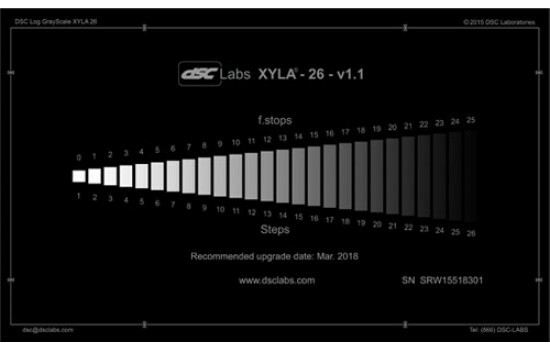 This rear-lit test pattern is invaluable for clients working in engineering and digital cinema, enabling them to evaluate and calibrate the dynamic range of high-end HDTV and digital cameras. Available with 20 or 25 f-stops of dynamic range, the Xyla must be used in a totally dark environment. Note: There is a 5-6 week lead time for this product. Created to produce the highest level of accuracy when dealing with limited light output, the Xyla features a unique shape similar to a xylophone, isolating shutter panels and a built in light source. Combined, these features have been shown to effectively minimize errors caused by light leakage, flare and the various forms of light leaks that have significantly reduced the accuracy of previous test systems.